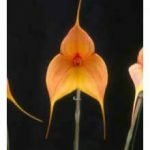 Masdevallias are cool-growing, free-flowering orchids with compact plants that will often provide a succession of colourful flowers throughout the year. 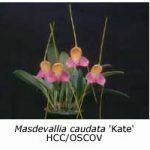 The flowers are produced in a variety of shapes, sizes and colours, sometimes complemented with a range of stripes or spots. Some 400 species grow in nature, mostly in Central and South America, the greatest concentrations being found in Colombia and Ecuador. 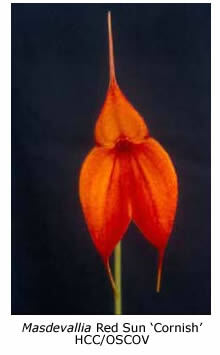 Although these are tropical countries, most masdevallias grow in the mountains, where cool, humid conditions prevail. In Melbourne they grow happily in a shade house, provided that efforts are made to maintain cool, humid conditions on hot summer days. 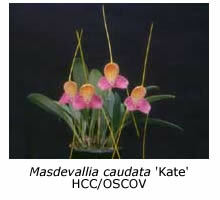 Most masdevallias have small, compact plants that can happily be accommodated in small squat pots of 75-100 mm diameter. The pots must have excellent drainage and some growers therefore prefer to use net pots or pots made of plastic mesh such as Gutterguard®. The preferred potting medium is live Sphagnum moss or equal parts of chopped moss and polystyrene foam. Best results are obtained if the plants are re-potted every two years or even more frequently. Re-potting is best carried out during cool weather in spring or autumn. 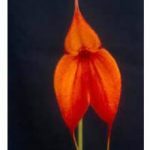 Masdevallias flower best if grown in good light (for example, under 50% shade cloth) but a compromise must be struck in hot weather when extra shading may be needed to help reduce the temperature and increase the humidity. They grow best at temperatures between 5°C and 25°C. Most withstand temperatures down to freezing but prolonged temperatures over 30°C may cause the leaves of some species and their hybrids to burn and fall, thereby weakening the plants. 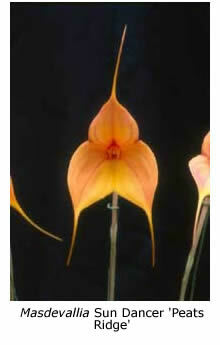 Masdevallias enjoy free circulation of a cool, buoyant atmosphere. A high level of humidity may be maintained by growing ferns in the vicinity and damping down the surrounding area, especially on hot days. The potting mix must be kept constantly moist but never so wet as to become soggy. The mix should never be allowed to become completely dry; if it does so, soak the whole pot in water overnight to restore the moss to the desired condition. Frequent misting of the foliage using water in an atomiser spray reduces the need for frequent watering. Growing a number of plants close together also helps to maintain a reasonable level of humidity. If you have only a few plants, it’s a good idea to place them on a tray of damp river pebbles or moss. Masdevallias respond to weak applications of liquid fertiliser throughout the year. It is important to use these fertilisers at concentrations less than a quarter of those recommended by the manufacturer, otherwise the fertiliser may kill the Sphagnum moss used in the potting mix, reducing it to a soggy mess.